Until the Observer began attending Lake Shore Hospital Authority meetings no one from the public attended and no one ever asked questions. Last year, one high ranking government official (name withheld) did ask the Observer how the LSHA could keep raising taxes as its income was increasing and it had millions in the bank. Ms. Dorothy Pattison has been the only member of the LSHA Board who has publicly stated that the Hospital Authority is there to help and care for the indigent. n August 11th of this year the die was set, when before the monthly meeting began, the Observer gave the Board five simple written questions concerning LSHA business. LSHA Attorney, Marlin Feagle and the LSHA outside auditor/accountant, Richard Powell, read over the questions. They both sat at the board table conversing with each other about which questions they could answer that evening. Moments before the meeting was called to order, Mr. Berry leaned back and said something to Board Attorney, Mr. Feagle. Then, with a smug look on his face, Chairman Berry called the meeting to order. After being totally non responsive to questions like how much money does the Authority have in the bank, how much have you spent on acquiring property, Mr. Berry claimed that those questions would be answered in writing, by him in ten days. Your reporter read a question. 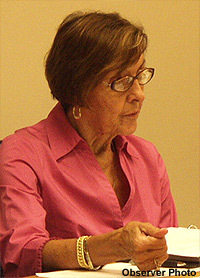 The question that went right to the heart of the Authority and the pockets of the working families of Columbia County: At an earlier meeting, Ms. Pattison said that the main charge of the Board and the Authority is the care of the indigent. Is this accurate? If not, what is it that you are now doing with the taxes that you collect from the working families of Columbia County? Do you believe that the people that pay the taxes have a right to know where their money is being spent and where your future revenues will be spent? Chairman Berry sat in stone cold silence looking at his watch. The rest of the Board seemed to be struck dumb. Again, Mr. Berry claimed that he would answer the question. It was unclear how he would be able to answer for the rest of the board members on what they thought was the purpose of the Authority. Mr. Berry looked at his watch. The unconscionable behavior of Chairman Berry, a Jeb Bush appointee, continued throughout the September 2008 Hospital Authority budget hearings, which mirrored his outrageous behavior of the August 11th, Hospital Authority meeting. 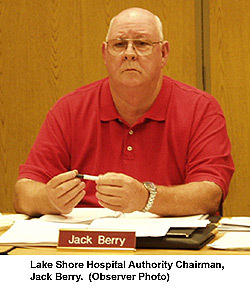 At the October 6th LSHA meeting, Lake Shore Hospital Authority Chairman, Jack Berry went over the top, proving once again that he is unfit for public service.